A blog about things that interest me as a Chief Information Officer (CIO) working for a local government. Primarily focused on technology, leadership and some of my recreational pursuits. Follow me on twitter at @BarryCondrey Enjoy! Okay, so my wife I have a dog. This is different for us. I've never had a dog before. I wasn't anti-dog or anything, I was more ambivalent about them. It is funny how fast I went from being dog-indifferent to being a dog-lover! 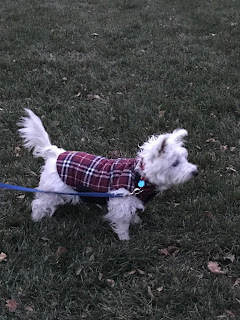 After years of talking about it, thinking about it, researching it, being encouraged to do it, we got organized and located a reputable breeder of West Highland Terriers (aka Westies). That is a whole other blog-worthy experience. We tried to adopt a rescue Westie, but got tired of waiting. I am the type of person that looks for inspiration in the ordinary parts of life. 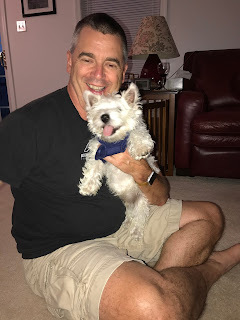 I spend a lot of time with my dog, Chester the Westie (#ChesterTheWestie). We walk a lot, play a lot, etc. I've observed some things about him that I can relate to, and being a technologist and leader, I draw some lessons from this. Your viewpoint is not the only one that counts. So when I look down the street I see certain things. When Chester, who is much shorter, looks down the street, he sees something very different. It is a valuable viewpoint. He can look under cars, under bushes, into pipes and down storm drains. How many viewpoints do you consider when making decisions? Is your view the only one that matters? As Col. Beak Howell (retired Airforce) used to say, "where you sit determines what you see". Technology leaders need LOTS of viewpoints. Chester is a terrier. A very cute terrier, but a terrier none the less. They are a bit barky as dogs go. I like Chester to bark when folks come to the door. I do not like it when he barks at leaves in the yard, or his reflection in the sliding glass door (although that is really cute). Knowing when to bark, and how loud and how long is a tough tough thing to teach a dog. It is even harder for us as leaders. If you bark at everything, loudly and longly, your organization will ignore you and avoid you. Choose your barking wisely and make sure you wag your tail more than you bark. 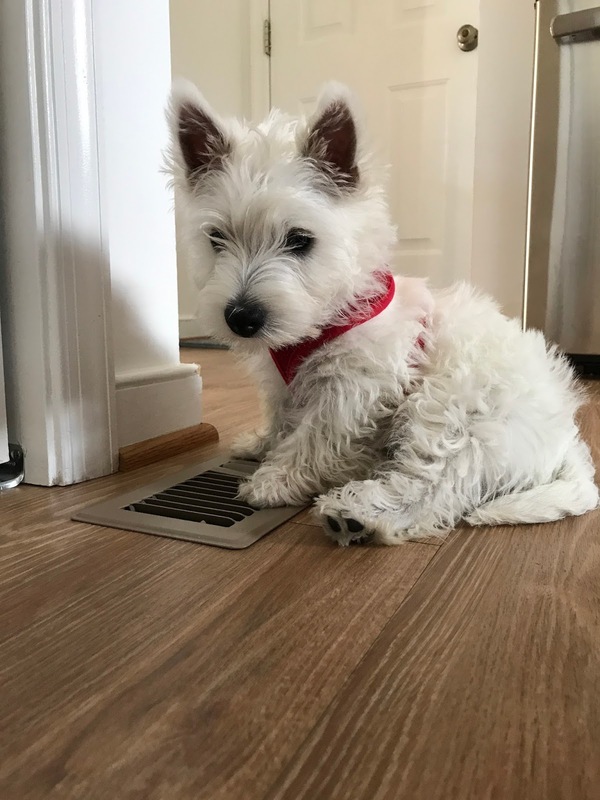 When Chester was 8 weeks old, he changed almost daily. He did new stuff, learned new tricks, and found new and inventive ways to be cute. He never stayed the same. Now that he is 11 months old, we still work with him to learn new things. Dogs love learning new tricks, just love it. The focused attention they get from us in the process is what they crave. That is what we should be after with our employees. Constant change, constant improvement, continuous learning. Technology is constantly changing, and we need to encourage people to change too. Your people will love the fact that you want to invest in them and help them grow and develop in their careers. My dog has more friends than I do. Chester goes to "doggie day camp" twice a week. He plays with other dogs, like a lot of dogs, for 8 full hours a week. He has friends in the neighborhood he plays with on walks. He LOVES to meet new dogs. There are absolutely no dogs he won't sniff, circle, and play with. My dog is a lot more welcoming than I am. When Chester meets a new human, he rolls over on his back for tummy scratches. Automatically. He is being vulnerable when he does that. Chester sets a great example of being welcoming and inclusive. You want people to trust you and follow you? Be vulnerable. Want more friends? Set aside time for play, and stop working all the time. Amazing what a dog can teach you! Hope you have enjoyed this. This post is approved by #ChesterTheWestie. ​Innovation is a big topic in civic circles these days. Creating value out of new approaches and ideas is at the heart of this. But first, an interesting example of innovation. Such a buzzword, Innovation. Means so many things to so many people. Can't live without it, can't be a successful organization without it, gotta have it. In local government we won't be designing bio-reactive tattoo inks, but we can have equally impactful innovations that help thousands of people. I gave the keynote address at a lottery tech conference in October, and this is what they wanted to hear about. It gave me a great chance to get my thoughts together on the topic. So what exactly is innovation? Ask ten people, you will get ten ideas. This isn't like project management where we can summarize the project by scope / schedule / budget. Innovation strikes a chord with many people, not always in a popular way. The first challenge is to get everyone on the same page. I like to think of innovation like a vegetable garden. You don't just throw seeds into a weed patch and shout "GROW". You have to spend time preparing the ground. You have to get the soil right. You have to water it. You have to till it. You have to keep the critters out of it. All of this has nothing to do with what is planted, but it has a lot to do with how well things grow. A properly prepared and cared for garden will grow an amazing variety of vegetables. I cannot drive innovation by telling people - "hey you, go innovate and do some stuff" any more than a seed will grow on it's own. It doesn't work like that. The correct culture needs to be in place. Preparing your organizational culture is sort of like preparing the garden. Companies have made fortunes by helping organizations determine what innovation is, and what it means to them. I've spent some time over the last year looking at this. I am convinced that our capacity for innovation will grow as our culture grows and changes, as we till and prepare the soil. The Myths - Stuff you will hear people say about innovation, where it may be misguided, and how you can deal with it. Innovative Culture - The three things you need to focus on to have an innovative culture. Will be three separate posts. So, stay tuned. More is on the way! Nothing like a goal and a commitment to incentivize me to keep up with the blog. New Years Resolutions - Technology Style! New Years is a great time for reflection. A new start. A new set of opportunities. A time to do things differently. While you are cleaning out your closets and figuring out which gym to join, spend some time planning how you can do some new great things in your technology life. Here are five places to start. I've left "Backup your stuff" off the list this year. If you aren't already doing that, I can't help you. Security - Let face it folks, it is time to get serious about information security. Why, you ask? Whats that? Never been hacked before? Good for you. Remember, the bad guys already have your information, they stole it from someplace else like the federal government, Yahoo, HomeDepot Target or any one of a thousand other places. They just haven't gotten around to you yet. Change passwords (see my next blog post for a method to remember them). Turn on two-factor for all your accounts that support it (also called second factor, enhanced security, second passcode, token generator). Delete old accounts. Review which apps have access to your Google & social media accounts. Make sure your virus protection is up to date. Smartphone Love - Show your smartphone some love by updating the apps on it. Get it to the most recent operating system release. Use software like "find my iPhone" or "lookout" to be able to find it, wipe it or lock it when you can't find it. Smartphones are amazingly easy to lose, and it happens all the time. Make sure you do the minimum by turning on a password or passcode. Delete apps you haven't used in 3 months. Learn Something New - Acquire a new skill in 2017. Learn a new coding language, become proficient in a new platform, develop a presentation on an emerging technology. Do something NEW. I don't mean play with something new. Part of the problem with technology these days is too many people play with it and not enough of them understand how anything really works. Above all else, be curious. This will impress your friends briefly at work and at parties. Friends & Followers - Just like your closets, your lists of friends need to be cleaned out. Consider who the chatter-boxes are, and whether you still want them in your feed. The day I dropped Guy Kawasaki was the day I could start using my Twitter feed again. Take a look at your feeds for a day, and see where all the traffic comes from. Don't be shy about dropping people, they won't take it personally. Emerging Technologies - The cycle for technologies to be conceptualized, realized, adopted and then mainstreamed is becoming shorter and shorter. We no longer have the luxury of waiting a few years to see how things will work out before paying attention to new technologies. Use 2017 to be more aware of what is new in technology and what it may mean for your future. There has never been a time in history when there has been more velocity in technology change. Don't get left behind! There you go. Five things to get on the old to-do list. Technology is supposed to make our lives easier, more efficient. These things will help you help your technology do that. Good luck. Innovation has been the focus of our conversations recently on my job. How to innovate. What it means to have an innovative culture. How to define the value of innovation. Innovation is one part of my vision for the department. 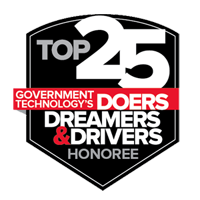 My deputy CIO recently gave an award for innovation within his area, and it went to one of our rockstar millennial employees, Christopher Long (@Chris_Long_VT). Chris innovates primarily in the GIS area, but that is just part of his reach. He also programs in Python and works with open data. Two of his primary outlets are the county ArcGIS Online pages GeoSpace and OpenGeoSpace. Check them out, much cool stuff about our county. Chris accepted the award and made some remarks that I thought were insightful and instructive. The remainder of this blog post are his (somewhat) reformatted remarks below. Unix has always fascinated me. I was hired to be a Unix communications programmer in 1986. I taught myself C, learned the X.25 protocol, HDLC, the seven layer ISO model and started struggling with the bourne shell. By this time I had been coding for 11 years, having started with BASIC in 7th grade. What stuck with me through all the years and versions and languages and floppy disks is the incredible versatility of Unix. For me there was, and is, a fascination with using free tools on inexpensive hardware to do impressive things. Fast forward 30 years. Unix has become Linux, and it is running on an amazing variety of devices. The source code can be customized by anyone. New lineages of Linux have emerged.Some are highly specialized, some are more generic. I run Linux on a half dozen platforms at home. It is a great way to tinker. It is a great outlet for curiosity. Here are a few of the examples. Late breaking note: My daughter just gave me (for my birthday) a Raspberry Pi model 3. Wifi, bluetooth, 4 USB ports, overclocked, all in the same form factor. Sweet! Ubuntu - I run version 14 (in long term support) on a old Sony VAIO laptop. On this I run the BOINC grid computing software and participate in projects to map cancer markers, sequence the ebola genome and do AIDS research. There are over 700,000 volunteers in this program, through the World Community Grid. See here: https://secure.worldcommunitygrid.org/index.jsp This is all very legit research for which there doesn't exist enough super computer power in the world. The workstation also runs background music for me and runs the TOR browser so I can anonymously and confusedly surf the deepweb. You don't need expensive gear and proprietary operating systems to do impressive things with computers. RaspberryPi computers are $35. The old laptop is, well, free. You get the point. What you absolutely need is a curious mind. Wow! It has been 6 months since I posted anything to this blog. Not setting a very good example I am afraid. It has been a busy winter and spring, and I have a lot of material stored up. Now if I just had the time to write! One thing I am working on for this fall that I am very excited about is a class at VCU that is near and dear to me: E-Government. This class is about using information and communication technologies to provide government services. Open data, social media, websites, APIs, collaboration & sharing networks. Students will review and assess different levels of government and their approach to e-government. Business models and implementation strategies for e-government projects will be examined. Students will be prepared at the conclusion of the class to assess, design, implement and evaluate e-government solutions. Students will be required to have and use a twitter account and other social media, create and contribute to blogs and use other digital resources. This will be a very hands-on course. No tests or exams, we will have reading assignments and writing assignments and a main project for the course. A word about me as the teacher for the class. I am not an college professor. I am a practitioner with 35 years in the IT industry, 9 years in government service and many awards. I have guest lectured for the FTEMS program as well as other graduate MIS classes. Information security, leadership, coding and networking are primary interests of mine. We will spend time on lots of websites for review of content and evaluating approaches including www.govloop.com, www.govtech.com, www.elgl.org, and www.data.gov. This is a new elective course, and is described in this doc on the www.vcu.edu website. Drop me an email if you want a copy of the syllabus. New Years is a great time for reflection. A new start. A new set of opportunities. A time to do things differently. While you are cleaning out your closets and figuring out which gym to join, spend some time planning how you can do some new great things in your technology life. Here are five places to start. Mobile Security - Smartphones are amazingly easy to lose, and it happens all the time. Make sure you do the minimum by turning on a password or passcode, although free software can defeat those in a few minutes. Software like Lookout (www.lookout.com) for your smartphone can provide awesome functionality like locating your phone on a map, automatically taking a picture, wiping the phone remotely and notifying you if the phone is powered off or altered. Make sure whatever solution you use supports malware detection. Two Factor Authentication - Passwords are fatally flawed for lots of reasons, and provide only one layer of security, the "something you know". Add another layer of security to your online accounts by using two factor, or two step authorization. It is the "something you have" layer of protection required for accessing your accounts. For google you can use a smart token or an auth code generator. Bank of America uses text messaging. As long as you require the "something you have" for access, the bad guys won't get in. Backups - If you don't protect your information, you will eventually loose it. Period. There are easy ways to do backups, and depending on how much money you want to spend, it can be all but idiot proof. Apple Computers have a great "time machine" backup facility. Lots of third party solutions for PCs, based on USB connected external hard drives. Cloud based backups are about as easy as it gets. I have use Carbonite (www.Carbonite.com) before, which is about $50 a year or so. Mozy (www.Mozy.com) is another cloud based solution. Although I work for a government entity, my opinions are my own and do not reflect on my employer. This is not an official government site but it is a cool one. State Tech Mag Likes Me! Info Tech Zone Loves Me!! !